The Saturday morning pairings have been named. Lefty will have a rest tomorrow morning. US RYDER CUP captain Tom Watson has decided to rest Phil Mickelson after controversially using the 44-year old twice on day one of this year’s competition. Watson was criticised for sending Mickelson back out on Friday afternoon but not using Jordan Spieth and Patrick Reed who dominated their match with Ian Poulter and Stephen Gallagher, winning 5&4. Poulter will have a chance to make amends for his poor showing on Friday when he joins Rory McIlroy for the final match on Saturday morning. The pair take on Jimmy Walker and Rickie Fowler who have halved both their matches so far. Justin Rose and Henrick Stenson will hope to repeat their Friday fourball heroics when they take on the new pairing of Bubba Watson and Matt Kuchar in the day’s first match at 7.35am. Lee Westwood and Jamie Donaldson have been rewarded for their victory in Friday’s foursomes with a match against Jim Furyk and Hunter Mahan. The four will be the second match on the course, teeing off at 7.50am. The morning’s other game with see rookies Spieth and Reed, so impressive on their debut, take aim at Thomas Bjorn and Martin Kaymer. The European pair had to settle for a half in this morning’s fourballs despite leading for most of the round. Email “McIlroy and Mr Ryder Cup pair up as Mickelson rested”. 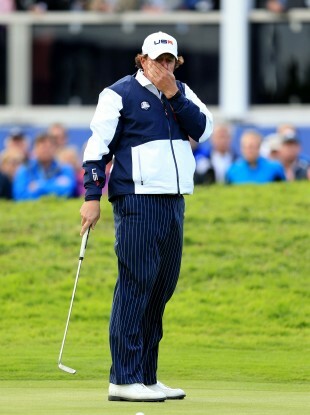 Feedback on “McIlroy and Mr Ryder Cup pair up as Mickelson rested”.